That oil—the profits from it and the control of access to it—was at the heart of U.S. motivations behind the invasion drew few skeptics, especially after the lie of weapons of mass destruction was exposed. And yet when it comes to understanding the geostrategic role played by the Israeli-U.S. alliance in the Middle East, not many acknowledge or draw attention to the importance of this resource, which is vital to the world economy and any nation seeking hegemony in the region. 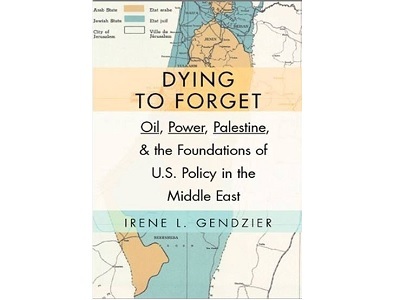 With the publication of Irene Gendzier’s Dying to Forget: Oil, Power, Palestine and the Foundations of U.S. Policy in the Middle East (2015), the central role of Middle East oil in explaining why the United States allows Israel free rein in oppressing the Palestinians can no longer be denied. Gendzier, a professor emeritus in political science at Boston University, documents how the “oil connection” became a decisive factor in convincing the administration of President Harry S Truman to fully support the newly created state of Israel. Despite its initial doubts about the wisdom of a Jewish theocratic state and its subsequent hesitancy to pursue the United Nations’ recommended partition plan, the Truman administration came to embrace Israel wholeheartedly after Zionist paramilitaries demonstrated military superiority in the 1948-49 war with other Arab nations. Although it knew those victories were won on the basis of civilian massacres during the Nakba and although it tried to encourage Israel to allow the return of Palestinian refugees after the war, the Truman administration never seriously applied pressure on behalf of the refugees or to allow the creation of a Palestinian state. Gendzier’s study, based on some newly declassified U.S. documents but mostly on a reappraisal of long-available sources, is the second in the past year to reexamine this crucial period in the history of U.S. foreign policy in the Middle East. John Judis’s Genesis: Truman, American Jews, and the Origins of the Arab/Israeli Conflict (2015) also shed new light on this period. Judis’s account focuses largely on the role of the Zionist lobby in the United States and ends with a reference to a memorandum from the U.S. Joint Chiefs of Staff recommending that U.S. policymakers adopt Israel as a strategic Middle East ally. Gendzier’s history covers much of the same ground but goes into more depth on the U.S. military’s reappraisal of Israel’s value at a time when “petroleum dominated U.S. planning for the Middle East.” Her analysis is also unique in exploring the role of Max Ball, the director of the Oil and Gas Division of the Interior Department under Truman, a figure largely overlooked in other histories because he was not a prominent figure in the White House or State Department. By examining Ball’s archived papers, particularly his exchanges with Eliahu Epstein, the representative of the Jewish Agency in the United States, Gendzier discovered the “oil connection” that contributed to the U.S. alliance with Israel. The papers revealed that far from fearing a possible rupture with oil-rich Arab nations due to a U.S.-Israel alliance, U.S. oil company executives were much more “pragmatic in their approach to the Palestine conflict.” Epstein and other lobbyists largely argued successfully with Ball and others in the U.S. oil industry that the Arab countries needed the United States as a customer and were, in fact, dependent on the United States and were unlikely to risk that relationship on behalf of the Palestinians. Indeed, the author notes, the U.S. oil industry expanded in the Middle East after Israel declared its independence in 1948. Fears that support for a Jewish state would lead to a rupture with Arab oil-rich nations nevertheless influenced Truman administration policy and the U.S. Joint Chiefs of Staff for a time. It is not generally known but after initially supporting the 1947 United Nations partition plan in the General Assembly, which was actually a nonbinding “recommendation,” key figures within the administration, including Truman himself, wavered. The administration began instead to consider the creation of a UN trusteeship following the expiration of the British Mandate. During the trusteeship they hoped to reach a solution amenable to both the Zionists and the Palestinians, including even the possibility of a binational or a federal state. The way that the Zionist paramilitaries carried out the Nakba was a key factor in this reconsideration. The Truman administration was well aware of the massacres taking place. The Deir Yassin massacre in particular motivated U.S. officials, including Truman, “to act against partition and in favor of trusteeship,” Gendzier reports. Also little known is the fact that following the Armistice agreement of 1949, the Truman administration pushed for the return of Palestinian refugees, fearing that a large refugee population would further destabilize the Middle East and strengthen Arab nationalism. The pressure was sufficient that Israeli foreign minister Moshe Sharett attempted to head it off by formally offering to repatriate 100,000 of the nearly 1 million Palestinian refugees in exchange for a peace treaty. 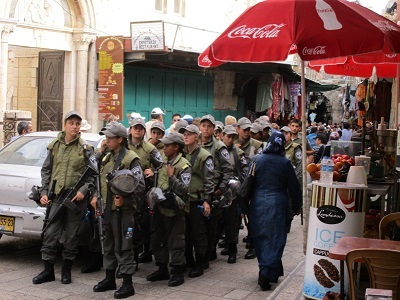 However, once the Truman administration determined that Israel would become a strategic U.S. ally, Gendzier notes that it adopted a policy to defer to Israel in matters related to the Palestinians. As early as July 1, 1948, Philip Jessup, the U.S. special delegate to the UN, had argued the case for withholding U.S. pressure on Israel due to its strategic importance and its “strong military position” which was “more than a match for most of Arab states put together.” This passage is quoted from a letter Jessup wrote to the U.S. Secretary of State, in which he also stated: “‘From the strategic viewpoint we assume that Palestine, together with the neighboring countries is a major factor presumably in any future major conflict this region would be of vital importance to US as a potential base area and with respect to our lines of communication. Presumably also the oil resources of the area are considered vital.’ ” As a result Jessup argued for not pressuring Israel regarding the return of refugees. Her nuanced answers make it clear that she believes a consensus emerged in the U.S. national security establishment in which the State Department, the Defense Department, and the White House were all on the same page in determining that the goal was to make Israel a key U.S. ally, especially as a way to counter possible influence by the Soviet Union. Similarly, she argues, both the Zionist lobby and what today has come to be called the military-industrial-petroleum complex shaped U.S. government policies in this period, policies that continue to this day. It is, indeed, striking to read the discussions of U.S. policymakers in the late 1940s and recognize how they echo forward today. In a recent campaign speech, for example, Democratic presidential candidate Hillary Clinton praised Israel for its “military prowess,” signaling a key reason for the continued U.S. support for Israel today. Broccoli is not likely to ever become the chief export of the Middle East. But what a terrible irony it is that Western imperialist interventions in the Middle East have centered around a commodity that is literally killing life on the planet through climate change. Peace and justice activists and climate justice activists have a common cause in the struggle to keep fossil fuels in the ground. War and the use of fossil fuels by the world’s militaries are in themselves significant contributors to climate change. Many climate justice activists are beginning to see the connections and are coming to understand why justice for the Palestinian people is an important component of this common struggle. Unfortunately, the leadership of many climate justice organizations lags behind their membership. – Rod Such is a former senior and managing editor for World Book and Encarta encyclopedias. He is active in the Occupation-Free Portland campaign in Portland, Oregon. He contributed this article to PalestineChronicle.com. The connection between climate justice and the demand for political justice is an important one. Many leftists are silent about Israel’s apartheid system and colonisation, they don’t want to muddy the brand. However, Seymour Hersh makes the argument that the US is in the ME to keep its important military bases and to keep the arms sales going. I remember that the US attacked the states and societies in Central and South America and the main exports there were coffee and bananas. Dying to Forget the Israel Lobby?